The Navy's September 30, 2010 December 31, 2012 selected acquisition report (SAR) latest SAR has rebaselined the Virginia-class submarine program at $93,207,300,000.00 (read $93.2 billion dollars) $91, 847, 400 for 30 submarines or $3,106,910,000.00 $3,061,580 per submarine1 platform (30-402 years of weapons, men, and maintenance are extra). The September 30, 2010 SAR for the Virginia-class submarine program is reporting a $1,813,400,000.00 increase over the June 2010 SAR. The "rebaselining" reflects a transition from development to production (Milestone III) notwithstanding the SAR attributes a substantial proportion of the $1,813,400,000.00 increase over the June 2010 SAR to an extension of the Virginia-class development program through 2027. Stated differently the contractor is in rolling production on the Virginia-class submarine program, notwithstanding declaration of Milestone III. The "rebaseline" is for Block I submarine platforms while development continues for Block II (SSN 778-783), Block III (SSN 784-791), IV (SSN 792-803), and V (SSN 804-807) submarine platforms. The benefit of using rolling production is that you can field a weapon system while you design it; the burden is that it's very expensive, as the eye popping price tag of today's weapons system attest. Additionally, managing total life cycle costs becomes very difficult and expensive as each succeeding block design is retrofitted or backfitted into the preceding block design. If the contractor cannot retrofit or backfit preceding blocks (because of design or costs constraints) then the Navy must manage multiple submarine platform configurations, rarely if ever desirable. Proponents of a 300+ navy shipbuilding plan appear to be expressing "hopes, wishes and aspirations" under the "Future Acquisitions" and "Improved Virginia" sections. Typically, "improved" platform refers to upgrading platforms in an existing class, not the production of a new class (i.e. follow-on class) characterized as "improvements" to the platforms in an existing class! Not sure if this "marketing" is clever or confusion or clever confusion? Alternative force structures for submarines—currently one 2014 VCS is being pushed out to the 2018 period—uncertainty in the Ohio class-replacement program persists. The Cato and Sustainable Defense submarine structures seem entirely reasonable—a lot of luck and leadership might combine to eliminate sea based ballistic missile weaponry altogether! In an era of increasingly sophisticated autonomous vehicles11 and expectations that nations synergistically partner to protect and patrol our global commons 37 American SSNs is not a trough. Of course, it's not necessarily the job of our Congressional Research Service to analyze whether proposed submarine missions and force structure reflect collaborators or cowboys. Unfortunately, our Congress and navy continue their wasteful and unnecessary efforts to build two VCS per year10—restoring $723 million for long lead procurement for a second VCS in 2014. UPDATED 12/10/2011 RAND, Learning from Experience: Volume I: Lessons from the Submarine Programs of the United States, United Kingdom, and Australia (other volumes MG 1128.2-4) deal individually with each nation's submarine program). Volume I is a general summary for how to manage a major weapons system program. Things every experienced program manager learns, understands, but does not always implement. If the intention is to document best practices for the inexperienced this volume is too general to be of much use—each chapter needs a comprehensive "cookbook" companion. As an aside it's unclear why the United States, United Kingdom, Australia and Canada do not develop, operate, and maintain integrated submarine platforms complete with interchangeable submariners? UPDATED 04/06/2011 GAO, Defense Acquisitions: Assessments of Selected Weapon Programs. GAO is out with its proforma March 2011 Assessment of Selected Weapons Systems. GAO is reporting among other items that4: the Navy thinks the contractor GD/EB is on a cost trajectory for achieving its $2 billion (2005 dollars) per VCS target; VCS program is 40 percent overrun; some performance and cost reducing design changes have been accomplished, others delayed, one abandoned; in-process (anechoic coating and torpedo room racks) problems have been solved. Our military and civilian leadership has known for many decades that DoD cannot and will not ever offer a clean audit of its accounts, which have often changed over the decades. It's unclear what has persuaded them to embark upon another fool's errand? UPDATED 05/13/2017 CSIS, Congress and Seapower: The View from The Hill SeaPower Subcommittee members advocating for budget lock on their ideated 350 ship navy. Hudson Institute roadshow for its proposed 350 ship Forces Structure Assessment (FSA). It seems incongruous for our "new" alt-white-house to simultaneously advocate an unprecedented and dangerous nationalistic isolationism and a bloated (48, 51, 66 fast attack platforms) sea power build up!? Also, CSBA, statement by Bryan Clark in support of Restoring American Seapower: A New Fleet Architecture for the United States Navy (i.e. 66 fast attack platforms). Our "new" alt-white-house's oxymoronic nationalistic-isolationism platitudes "America first" and "make America great again" are not measurable metrics or data! The Navy's 2016 Force Structure Analysis (FSA) did not come with the SecNav's FSA announcement—for now all we can say is our navy is asking Santa Claus to deliver a lot of Christmas presents! Even Santa Claus has budget and funding limits! But, evidently SecNav's bloated boat announcement is conservative because to counter "all the threats out there" would take a 653 ship navy! Whew, that's a relief...did we stop random drug testing of our sailors and analysts? Navy (N97 and PEO Submarines) discuss block changes for Virginia-class platform. Whether a steam leak failure in the submarine's power plant primary loop12 is "catastrophic" depends on the platform's operational profile at the time of the failure. Suffice it to say no submariner wants to experience a power plant primary loop steam leak, even with a platform operational profile of Beaufort state zero, positive platform buoyancy, flank speed, and periscope depth! The word "hot" in the context of a submarine’s nuclear power plant refers to temperature and radioactivity. Suffice it to say a primary loop elbow's (by definition up to an approximately 90o redirection of a "hot" pressurized fluid) fatigue and brittleness do not improve during the power plant's 30-40 years estimated life-cycle. This article is woefully lacking in the details necessary for an interested public to adequately and accurately estimate the total impacts of the "elbow" subcontractor's performance failure, which may be the result of the ongoing (criminal?) investigation. Asking SecNavs and CNOs if the navy has enough attack submarines is like asking children if they have enough ice cream! "Electric Boat Corp., Groton, Connecticut, is being awarded a $102,876,417 modification to previously awarded contract N00024-10-C-2118 for additional lead yard services and development studies and design efforts related to Virginia-class submarines." NavSea must publicly release additional information on this Virginia-class submarine platform's potential power and propulsion plant piping failure, including platform operational limitations pending completion of the supplier investigation and corrective actions. UPDATED 12/08/2014 FBO, Long-Range Research and Development Plan (LRRDP) of Today and DefenseOne, Why Does the Navy Still Not Have Enough Money for New Submarines? A question the recently nominated SecDef, Ashton Carter will often ask (or mumble) over the next several years. In the unlikely event of a non-DoD component donating or reprogramming $80B of their budget, solutions will likely mean fewer separate common class (i.e. SSN, SSN-X, SSGN, SSBN, SSBN-X) submarine platforms. Increased reliance on combinations of uncommon, non-traditional and alternative submarine and other platforms seems likely. 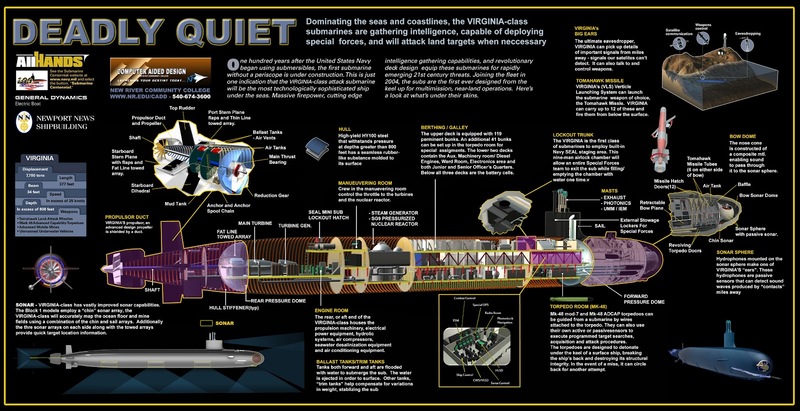 Post Virginia-class, Block VII platform exploratory project, SSN(X) announced at this years sub-league symposium. The announcement is about as meaningful as announcing a preliminary project for the purpose of exploring a redesign of a navy coffee cup. Our submarine designers are continuously projecting (no pun intended) and pitching all matter and manner of next generation submarine platforms, with or without realistic threat parameters—that's what submarine designers do. However, it's a bit unusual for these pitches to go public 30 plus years pre-IOC—guess today's eye-popping platform price tags demand earlier starts? The good news is that next generation platforms increasingly require first principle understanding and advancement as opposed to purchasing more and larger displacements and throw weights. Such will no doubt be a focus of session two (Technologies for SSN(X)) at next years APL Submarine Technology Symposium. The navy and contractors are putting some thinking and effort into cross class design and procurement, which may impact the estimated total cost of ownership for both VCS and Ohio-class-replacement platforms? As if it wasn't difficult enough to accurately measure and track the acquisition target costs of a single class submarine platform. NavSea awards General Dynamics, Electric Boat (GD/EB) a fixed price incentive contract for Block IV Virginia-class submarine platforms (qty 10). The contract's incentive targets and amounts to be shared between prime contractor (GD/EB) and major subcontractor Newport News were not disclosed? Jane's 360 reminds us that changes to the original baseline design and configuration, typically referred to as "improvements", have been made for Block IV platforms. These "improvements" again realign any "cost growth" with existing expected budgets. The navy, contractor and congress simultaneously pronounce the "improved program", which typically change an expensive coach platform into a relatively more affordable pumpkin platform the Cinderella of military procurement programs. Rear Admiral Barry Bruner commingles Virginia-class and inchoate Ohio-replacement-class (ORCS) submarines (VCS and ORCS, respectively) in support of our navy's desire of funding a two VCS and one ORCS per year shipbuilding program. Presumably the admiral intends the reader to use current VCS program performance as simultaneous evidence, threat and incentive in support of the inchoate ORCS? To put it kindly the admiral is comparing apples to oranges or stated differently he's comparing a descoped, restructured, redesigned, and rebaselined VCS program to the inchoate ORCS. Only those unfamiliar or uninformed about the origins and history of our VCS program would seriously credit such a comparison. Of course, the admiral's sensitivity to VCS and inchoate ORCS submarine platform milestones, costs, and commonality are welcome, if short of any meaningful details. We can only hope to hasten our navy's transition to a single submarine platform with a variety of mission modules (tactical and strategic) in inventory. 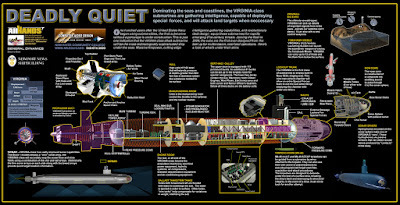 UPDATED 08/03/2012 BusinessInsider, Step Aboard The Navy's $2.4 Billion Virginia-Class Nuclear Submarine Some nice below decks images. A significant benefit of a reduced submarine force structure is that our navy will not sink money into submarine platforms searching for yesterday's obsolete Cold War missions or awaiting an infinite variety of China war game scenarios (one scenario is currently playing out in the South China Sea, Spratly Islands between Chinese fishing and surveillance vessels corralled by Philippine ships—both nations have wisely withdrawn their military vessels as diplomats resolve the playground dispute) . Instead, our navy can focus its limited resources and considerable research and development prowess on maturing next generation technology. Technology that will be required to economically build platforms responsive to tomorrow's missions. Notwithstanding the considerable efforts by some of our politicians, tomorrow's missions will require Russia and China's participation as responsible partners, not political whipping boys. UPDATED 03/31/2012 Reuters, Internet search yields bogus arms parts from China Two of the 16 suspected bogus electronic parts are used on the Ohio-class and Los Angeles-class submarines. A recent GAO report that describes GAO's request for purchase of 16 electronic parts. The purchase orders divided the parts into three categories--authentic parts that are rare or obsolete (7); authentic parts with manufacture date codes beyond known last date of manufacture (5); and parts with completely bogus part numbers (4). Hundreds of Chinese and a few non-Chinese vendors responded. GAO accepted low bids from the Chinese vendors9 and sent the part for testing to an independent laboratory. The two parts used in submarines (GAO assigned identifiers MLL1 and YCC2) failed macroscopic and microscopic tests. All 16 parts described in the GAO report are suspected counterfeit parts. These types of inspection and analysis must become built-in features of international trading protocols. Including provisions for allocating company and country responsibility for every counterfeit product (not just military) entering the stream of international commerce. It remains a mystery why our navy's 2013 shipbuilding plan (pdf) is proposing to build 46 Virginia-class submarines8 (VCS, SSN Attack) between the years 2013-2042. Perhaps congressional inertia in transitioning to an equivalent non-military jobs programs and enhancing our multilateral cooperation with like-minded peer nations. The bottom row, SSN-Alt is not part of our navy's proposal but included to show a total (30), if one VCS is built each year between 2013-2042. Our navy's 2013 shipbuilding plan proposes dismantling eight Los Angeles-class submarines (SSN 688) between 2014-2017 and conversion of two SSN 688s to moored training submarines during this same period. Interesting comments on acquisition processes by Under Secretary of Defense Frank Kendall—cost caps, life-cycle-costs budgeting, (un)affordability, contracting types, value maximization, data driven management, workforce quality, industrial base, industry performance improvements and professional development, etc. Related post Navy’s Science Chief Targets Practical Fleet Concerns to reduce the cost of platform life-cycle ownership. A test balloon for the upcoming 2013 defense budget—the pentagon floats a precarious proposal for a precarious posture—no change to the current VCS posture; SBSD (aka Ohio-class replacement) delayed a couple of years. More after the release of the actual 2013 budget and proposal (RFP) for the next block of VCS. UPDATED 11/27/2011 Defense Secretary Panetta and Congressman Courtney (R-CT) visit Electric Boat (EB) to express support and appreciation for those building our VCS. Also, the recently appointed debt- reduction committee's inability to reach an agreement is expected to trigger sequestration, which will likely impact the VCS submarine construction (see NOSINT,Virginia-class Sub Program Likely To Survive for another VCS impact view). Further legislation could alter the sequestration before it takes effect in 2013. The President has expressed his preference for Congress to reach agreement on debt reduction and indicated he'd veto legislation aimed at circumventing the sequestration. It's probably unrealistic, if not down right delusional to assert that our navy and submarine builders should stop doubling then halving budgets in response to simple changes in our government? UPDATED 08/18/2012 How Politicians and the Press Overstated Military Budget Cuts by $100 Billion These headlines may shock our citizenry, but our experienced defense and congressional budgeteers and bean-counters gave up long ago trying to accurately determine our Pentagon's budgets or its actual expenditures! Before reading this article I would not have guessed you could quote five admirals (one select) in a ~1200-word article about submarines—admirals that say nothing about the gains implicit in common cooperative strategies. Uncertain what to name the evolving strategy, the admirals' first priority is building 12 new ballistic missile submarine platforms (Ohio-class replacement) between 2019 and 2033, inclusive6. The second priority appears to be the purchase of 46 new VCS between the years 2011-2041, which is not a "changed landscape" so much as a temporary dip in the existing landscape. A changed landscape would be the purchase of 32 new VCS between the years 2011-20317 coupled with an improvement program for 14 of the existing VCS platforms, beginning around 2031. Alternatively, instead of building two VCS for the years 2011-2017, 2019-2022, 2035, 2037, 2039, and 2041 simply level load one VCS for all years between 2012-2041, completing the two VCS already in-process for 2011. Our navy can designate, as appropriate any of the new 32 VCS platforms to receive a payload-stretch section. Begin the non-recurring effort for the VCS-improved platform follow-on, as appropriate. UPDATED 10/21/2011 The Submarine Review, Submarine Technology Symposium (subscription) Several articles on the challenges and cost of the VCS platform. UPDATED 07/17/2011 USNI, The Sweet Smell of Acquisition Success. The article discusses the VCS acquisition lessons learned, primarily after the 2005 period—unfortunately those lessons will have minimal impact on the VCS's total life-cycle costs5. Reducing or eliminating the opaqueness from our acquisition process of major weapon systems will help ensure that assertions of the sweet smell of success will pass the smell test. UPDATED 04/23/2011 Time, How to Save a Trillion Dollars. UPDATED 02/26/2011 Full FY2012 Defense Budget Request. The next VCS christening (Fall 2011) is the Block II, USS Mississippi, SSN-782 [Builder: GD-EB; Sponsor: Allison Stiller; Officer-in-Charge: Commander John McGrath]. Virtual below decks tour (360o) of some VCS spaces on USS New Mexico SSN-779. UPDATED 12/11/2010 Aviation Week, Navy Hard-Pressed To Meet Sub Numbers. It would be an even more interesting world if these modern-modular-snappable submersibles3 were virtually modeled, configured, tested, manufactured, christened, and commissioned...just in time for its mission and submariners (unless the snappable submersible happened to be crewless). 1. The original 1995 baseline cost for 30 submarines was $64,040,000,000.00 or $2,134,666,667.00 per submarine. The original estimated price was $1 billion dollars per Virginia-class submarine platform (refer to New Attack Submarine Capability -- Acquisition Decision Memorandum (NASC-ADM) Milestone 0, dated August 28, 1992)! UPDATED 05/07/2014 The GAO is out with a different set of 2014 numbers which estimates the current VCS program cost at $84,350,000 or $2,811,667 per platform, in the unlikely event the original quantity of 30 platforms are procured. GAO's uses a first full program estimate (different from the first or original estimate) of $63,582,000. 2. At the end of the submarine's life, additional costs are incurred for decommissioning and decontaminating the radioactive reactor compartment, reactor, and reactor core. The decontaminated reactor compartment minus the reactor core is then sealed and securely buried as mixed low-level radioactive waste—for hundreds of years. 3. There's no reason to limit the possible modular designs to snappable submersibles characterized by the SSN, SSBN, or SSGN configurations. 4. UPDATED 04/09/2011 Not included in GAO's proforma VCS 2011 assessment is the recent failure of the oxygen generator onboard the Virgina-class USS New Hampshire. The VCS oxygen generator (i.e. Integrated Low Pressure Electrolyzer) is produced by Hamilton Sundstrand, Sea Systems using integrating Proton Energy Systems' electrolysis cell stacks, which is based on proton exchange membrane (PEM) technology. The recently qualified Integrated Low-Pressure Electrolyzer is next generation technology, so its failure is of some concern. Neither the Navy nor contractors have yet provided a root cause for the mission critical system’s failure. 5. Captain Michael Jabaley (VCS Navy program manager) in a comment to the main article conjectures an increased VCS operation tempo (i.e. more at sea time per platform which is primarily dependent on platform MTBF). Time will determine if this conjecture is proven true? 6. Vice Admiral Richardson seems certain that a new undersea warfare strategy should not be called "post-Cold War". Which seems appropriate since a "post-Cold War" strategy will require more than deploying fewer ballistic missile platforms using fewer missile tubes (although a good start)—our nation must also transparently substitute common cooperative strategies and eliminate confrontational strategies. 7. UPDATED 12/24/2011 The remaining Los Angeles-class (688 and 688i) fleet were commissioned between 1985 and 1996—last in Los Angeles-class is the USS Cheyenne (SSN 773). A submarine's operation, maintenance, and overhaul history will determine its safe hull life, but rarely will its safe hull life exceed 38 years. Unfortunately, the economics of maintaining our older submarine fleet often dictate inactivation before its safe hull life. Most or all Los Angeles-class will have been inactivated by this date—many will be decommissioned or scrapped. 8. Hopefully, those familiar with our aircraft carriers and their role in the 21st-century battle space will publish more details about our navy's proposed 11 aircraft carriers. It's unclear what use 11 carrier battle groups are in the 21st-century battle space—in the congressional battle space, they provide justification for a plethora of additional weapons programs and platforms, including the attack submarine platforms. 9. It's not clear if GAO exercised any "price sanity checks" before accepting the lowest Chinese bidder. Vendors that are ignorant, corrupt, or criminal are often unfamiliar with a military part's specifications or requirements and will submit obviously silly bids. An experienced purchasing agent will simply ignore an obviously silly bid. 10. Producing two VCS per year may make sense under some circumstances—for example, future plans to sell or lease one or more VCS to another Pacific partner nation. 11. Carting up to 65 cruise missiles (count assumes four vertical tubes modification, currently scheduled for 2019) around the oceans to periodically launch a few salvos in support of Special Ops does not seem like an optimal use of a $4.08 billion dollars (2016 dollars) submarine platform, which is crewed by 137 highly trained submariners. UPDATED 09/23/2012 The above paragraph would change significantly in the unlikely event that the recently approved quad-pack for the Ohio-class follow-on is swappable with a VCS quad pack—effectively creating one common submarine platform with the ability to snap-in (weld-in for now) strategic or tactical missile quad pack modules. UPDATED 10/21/2012 DoDLive, The Next Generation In Submarines Our navy must publicly release the referenced study purportedly justifying divergent SSBN-X and VCS submarine platforms. The post does not state with specificity the exact divergent design constraints, trade-offs, and related cost drivers. 12. The article's usage of the confusingly phrased, "pipe joint near the innermost chamber of its nuclear-powered engine" may refer to a location outside the primary loop and reactor compartment? It would be helpful and useful to specify a component's location (defective elbow) by providing the nearest hull ring stiffener (aka station number) and distance from the submarine's longitudinal center line (see Virginia-class cartoon for approximate component locations). See above cut-away Astute-class cartoon for a convoluted routing of the submarine's large (approximately 10 inches for the Nuflo elbow) tertiary steam duct piping—number 24.